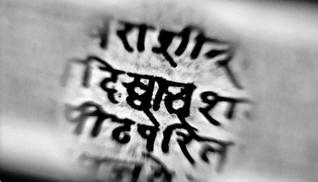 In Punjab, a film maker explores how there exists a unique tradition of ‘seva’ that preserves as well as destroys old scripture. The concept of ‘sewa’ or selfless service for the community has a unique place in Sikhism. As a means to promote humility, which is one of the three fundamental principles of the faith, its purpose is to work voluntarily for the betterment of humanity. It took Daljit Ami, an independent film maker from Punjab to discover that as a result of varied interpretations of ‘sewa’ in the context of Sikhism, not just the preservers but destroyers of precious heritage in Punjab draw upon ‘sewa’ to justify their deeds. His latest film titled what else but Seva, documents some unique efforts in both directions. The target is ancient religious and literary manuscripts endangered by neglect, disuse and the march of time. To preserve these mostly handwritten documents, old editions of the Guru Granth Sahib and many more scriptures is the stellar work being done by Chandigarh based Punjab Digital Library which has digitized some 7.5 million pages since 2003. People like Devinder Pal Singh went from village to village to search for old ‘birs’ of the Guru Granth Sahib and other manuscripts which they could digitize. From 5,000 pages a month, they now do some 3,000 a day. Then, as the work grew people began approaching them with books, photographs and newspapers too and they began doing those too. “Anything related to the history, culture and literature of Punjab and our catchment area is both Pakistan and Indian Punjab, Haryana, Himachal Pradesh and north India in general from where we get old material that is digitized to preserve its content, if not the physical form”, he says. But Daljit’s keen camera has also documented the destructive aspect of several ‘Angitha Sahib’ gurudwaras in Punjab and elsewhere – secretive but well organized places - where old scriptures and manuscripts are systematically cremated in huge quantities. The logic behind these crematoriums is the Sikh philosophy handed down by the Tenth Guru Gobind Singh that their holy book, the Guru Granth Sahib is the embodiment of a guru and no one else has that privilege. “When the Guru Granth Sahib is our guru, he has a life and will die too. Have you seen anyone holding on to the body of his or her father? When the ‘guru’ scripture grows old, its parts are torn and faded, it has to cremated and we are doing this holy task,” he says. Daljit was not given permission to film the huge crematorium at the gurudwara , or the room where scriptures from all over India, Pakistan and sometimes from different parts of the world are given the ritual purification bath and wrapped in clean clothes preparatory to their cremation. He took the shots with a zoom lens from outside the boundary walls. But Harsharan Singh did tell him that “though this is a secret place, we have no paid help, all who work here are volunteers and we have no shortage of anything, be it, ghee, wood or perfume needed for the cremations.” The cremated remains are then collected and immersed in the river Yamuna that flows nearby. The Angitha Sahibs that are known to exist in Goindwal Sahib and Ludhiana in Punjab and this one in Paunta Sahib. And all of them have an extensive network of collection centres where old manuscripts some 80 to 100 years old come. They need not be just Sikh scriptures, for as Harsharan Singh informs, they get holy books of Hindus, the Gita, Ramayana, the Bible and a variety of other scriptures from Jainism, Buddhism, Islam too and all are cremated with the same reverence and sanctity. “God is one and he is embodied in the scriptures of all religions,” they believe. 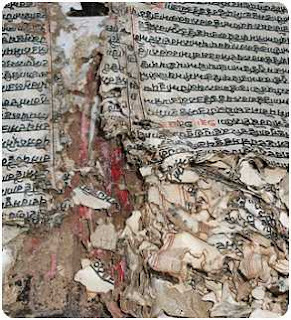 When Devinder Pal showed the sants of Goindwal Sahib the preserved scriptures on his laptop, they were angry and wanted him to show them where the original old works are so that they could cremate them. The logic may not appeal to many, but theirs is also a kind of ‘seva’. And their followers are many. Seva throws light on other efforts at preserving old books, sometime single handed ones like that of Gurdev Singh Sidhu an author who rummages in old shops of Malwa in Punjab for torn, termite eaten works of Punjabi narrative poetry – a dying tradition. This is Daljit’s tenth film and will be screened at the Punjabi International Film Festival later this month.